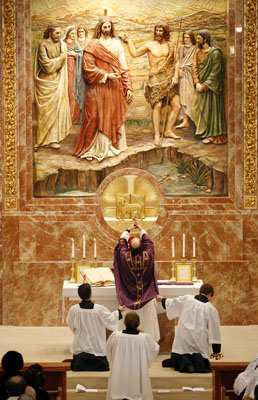 The following story, which we should welcome with joy, concerns Pope Benedict XVI celebrated Mass on the Baptism of the Lord in an ad orientem posture. The following article is from Reuters and my comments following in red. VATICAN CITY (Reuters) - Pope Benedict celebrated parts of Sunday's Mass with his back turned on the congregation [The ad orientem posture should never be described as facing away from the people. The ad orientem posture is facing East; both the Faithful and the priest together face East, symbolically facing God and awaiting His return since it is traditionally believed that Christ will come from the Easter], re-introducing an old ritual that had not been used in decades. 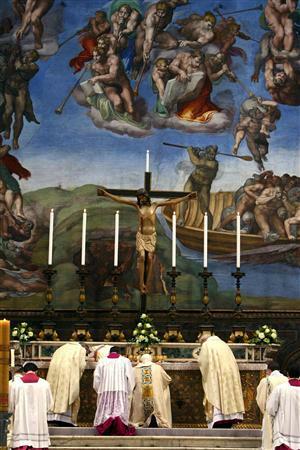 The Pope used the Sistine Chapel's ancient altar set right against the wall under Michelangelo's dramatic depiction of the Last Judgment, instead of the altar placed on a mobile platform that allowed his predecessor John Paul II to face the faithful. A statement by the Vatican's office for liturgical celebrations said it had been decided to use the old altar, where ballots are placed during papal elections, to respect "the beauty and the harmony of this architectonic jewel." 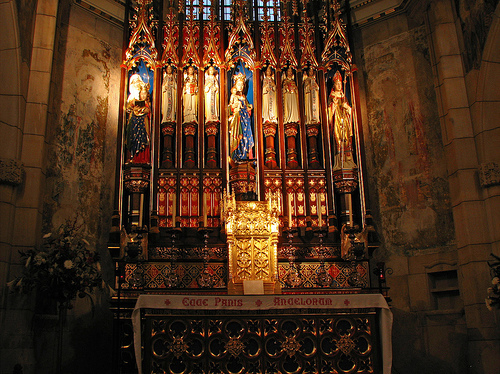 [The High Altar is indeed beautiful and should be used more frequently. 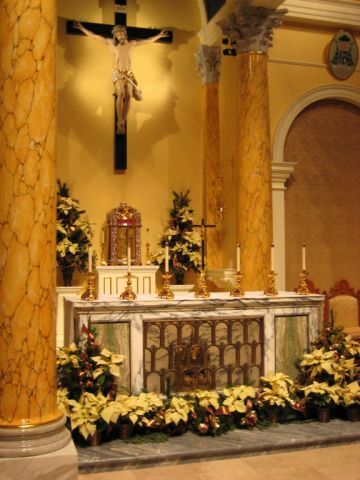 Vatican II never called for the use of a low altar or the abandonment of the ad orientem posture]. That meant that for the first time in this kind of celebration since the Second Vatican Council (1962-65), the pope occasionally turned his back on the faithful [no, everyone is facing God] and faced the Cross [rather Our Lord truly present in the tabernacle]. He also read his homily from an old wooden throne on the left of the altar used by Pius IX in the 19th century [another beautiful addition to the Liturgy]. The conservative German-born pontiff is slowly reintroducing some of the old rituals phased out after Vatican II, which substituted Latin for local languages [it may have allowed the vernacular but Latin remains the chief language of the Church (Second Vatican Council, Sacrosanctum Concilium(Constitution on the Sacred Liturgy), para. 36.1)], modernized the Church [The Church can not modernize; poor choice of words (Pascendi Dominici gregis, Lamentabili Sane)] and encouraged inter-religious dialogue [for the purpose of saving the souls of others through conversion]. In July, the Pope issued a decree allowing wider use of the old Latin mass [Referencing the Tridentine Mass, not the Novus Ordo in Latin and ad orientem, which never required any permission], in what was regarded as a nod to Church traditionalists. He has also said he would like the centuries-old Gregorian chant to make a comeback [According to Vatican II, it is to be held in high regard anyway]. During Sunday's mass commemorating the baptism of Jesus Christ, which was celebrated in Italian, the Pope baptized 13 babies, carefully pouring water on their heads from a golden shell. He spoke about the significance of baptism, which marks the admission of a person in the community of Christians. With the start of another year I would like to outline my goals for this blog throughout the year. I will need some help in achieving some of them. Post as often as possible. I can not post while I am in seminary, but I am allowed to post outside of the seminary building. So, if I do have time, I will try and visit a nearby library and post occasionally over the next few months. Edit/Update Past Posts. I have a few thousand to edit because I want to have each spiritual reference link to the verse in the Douay Rheims Bible. I also want to put on each page about a saint the Collect from the 1962 Missal. 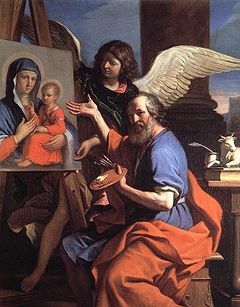 St. Luke was a famous painter. He wrote one of the Gospels and painted a famous image of the Blessed Virgin Mary. If making images of the saints were a sin, surely a Gospel writer would not have done so! Numbers 21:8 God commands Moses to make the bronze serpent which we learn is a symbol of Jesus Christ (John 3:14). It is only destroyed after it is worshiped (2 Kings 18:4), the making of it was not a sin. There were images of the cherubim angels in the temple (1 Kings 6:23-31) and God blessed the temple (1 Kings 9:3). Exodus 20:5 We are forbidden to worship images or serving them. But by praying in front of a statue of a saint or a crucifix, we do not pray or worship the image, our thoughts are gazed upwards from them towards God. Conclusion: There are many other passages to counter the notion that our Divine God somehow prohibits the images of our Savior, the saints, et cetera. This is not a new debate. This debate first arose in the 7th century and was crushed as a heresy against the Christian religion. If you are sincerely seeking to understand the Catholic claims that images are not sinful, I ask for you to read the writings of the Early Church Father St. John Damascus. His Three Treatises on the Divine Images (available also in a Kindle Version) is as useful today as it was back in the 7th century to show - using Sacred Scripture - why the use of images is permitted and blessed by God! As readers will remember from my past post, Mission: Restore Eucharistic Reverence, I encourage the reception of Holy Communion on the tongue as opposed to Communion in the Hand. My comments on this article are in the red brackets. For those that are refused the ability to receive Communion on the Tongue while kneeling, I highly encourage you to write a formal letter of complaint to your bishop and/or Vatican officials. Some helpful pages may include Contacting Vatican Officials as well as Addressing Clergy. Although it may seem a little strange, there is a definite battle being waged within the Catholic Church. It is the same "culture war" being waged by secular moderns against those who uphold traditional morality, it is pro-life vs. pro-choice. But within the Catholic Church the same battle is fought along liturgical lines, and the publication in the Vatican newspaper of an article calling for Catholics to receive Holy Communion kneeling and on the tongue is telling. Modernizers who relentlessly work to have the Catholic Church move away from so-called 'archaic' positions on sexuality , (forbidding contraception, pre-marital sexual activity, homosexuality etc.) [Such actions are heresy] also rail against 'archaic' piety in worship. However, the culture war at least in terms of liturgical issues was nearly lost in the West until the advent of Pope Benedict [Deo Gratias. Please remember to pray for the Holy Father daily. Thank God often for Summorum Pontificum]. In the United States for instance, the US Conference of Catholic Bishops (USCCB) Committee on the Liturgy wrote in its July 2002 newsletter: "Kneeling is not a licit posture for receiving Holy Communion in the dioceses of the United States of America unless the bishop of a particular diocese has derogated from this norm in an individual and extraordinary circumstance." 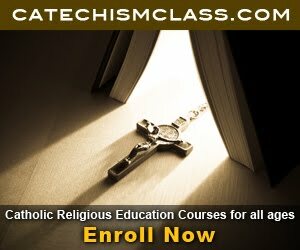 However, some traditional Catholics, often derisively referred to as "pre-Vatican II" Catholics have held to the practice of communion kneeling and on the tongue. Those same Catholics are often the most vociferous defenders of life and family within and without the Church. One prominent example of such was Orange County Florida Bishop Tod Brown who was caught on video last year refusing communion to a woman who was kneeling. Brown is also known for refusing in 1994 to back an Idaho measure to deny homosexuals special privileges. Explaining his actions he said the law "would contribute to attitudes of intolerance and hostility in Idaho directed at homosexual citizens and is potentially discriminatory." In Brown's diocese there has been considerable intolerance toward Catholics who kneel for communion and some traditional Catholics have been asked to leave the diocese. These types of situations caused the Vatican to react rather strongly in 2002. Jorge A. Cardinal Medina Estévez, the head of the Vatican's Congregation for Divine Worship and the Discipline of the Sacraments, which addresses liturgical matters, wrote a bishop about reports received of a priest denying communion to faithful because they were kneeling. The Cardinal called such denial "a grave violation of one of the most basic rights of the Christian faithful," and directed the bishop to investigate the case. The letter said that the Vatican regards such abuses of the faithful as very grave. The letter said, the Congregation, if such actions are verified, "will regard future complaints of this nature with great seriousness, and if they are verified, it intends to seek disciplinary action consonant with the gravity of the pastoral abuse." Those who kneel have a champion in Pope Benedict who prior to his elevation to the pontificate wrote of kneeling and its tie to culture in his book 'The Spirit of the Liturgy" (Ignatius Press, 2000) "There are groups, of no small influence, who are trying to talk us out of kneeling," wrote then-Cardinal Joseph Ratzinger. "'It doesn't suit our culture', they say (which culture?) 'It's not right for a grown man to do this -- he should face God on his feet'." Cardinal Ratzinger continued: "The kneeling of Christians is not a form of inculturation into existing customs. It is quite the opposite, an expression of Christian culture, which transforms the existing culture through a new and deeper knowledge and experience of God. This is all very exciting news. Comments? Cardinal Jose Saraiva Martins, Prefect of the Vatican's Congregation for the Cause of the Saints, has announced that the beatification of the great British convert and scholar, Cardinal John Henry Newman, is "imminent." In an interview to be published on Wednesday in the daily Italian edition of L'Osservatore Romano, Cardinal Saraiva said that among the most important personalities to be beatified "soon" is "the case of Cardinal Newman, a relevant intellectual, and an emblematic figure of conversion from Anglicanism to Catholicism." "Personally, I wish his beatification to happen very soon because it would be very important at this moment for the path of ecumenical dialogue,” Cardinal Martins said. Cardinal Saraiva Martins also revealed the beatification, latter this year, of the parents of St, Therese of Lisieux, Louis Martin and Azelia Guérin. The heroic virtues of the parents of St. Therese, who is now one of the most popular saints in the Catholic Church and a Doctor of the Church, were proclaimed on March 26, 1944. 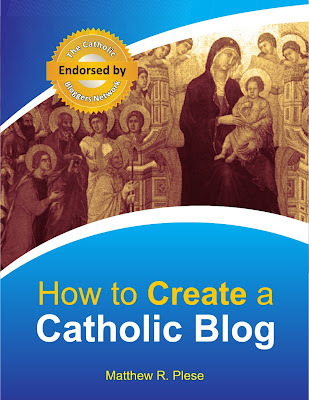 I have just joined the Catholic Converts Blogroll! If you have not visited this blog, I encourage you to visit. 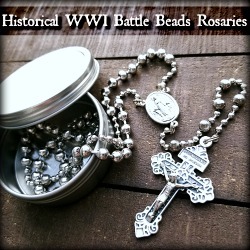 In addition, please pray for all of the people in the sidebar of the Converts Blog under the RCIA List. Anyone that is preparing to enter the Church this year needs our prayers. As evident by the above photo taken in recent months, Pope Benedict XVI is reviving many traditions. In July 2007, by the grace of God, Summorum Pontificum asserted that the Tridentine Mass was never abrogated, and the Holy Father allowed for all priests in the world to celebrate the Extraordinary Form of the Roman Rite. 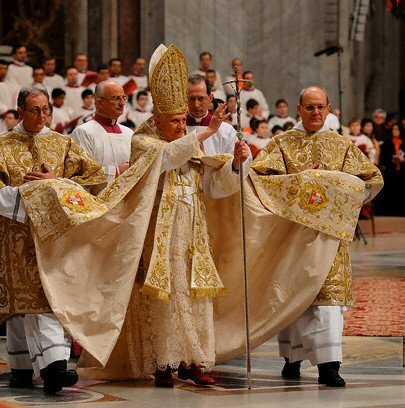 He continues to revive tradition, evident by his choice in miters, copes, and thrones such as at the Christmas 2007 Urbi et Orbi Address. Therefore, the news of millions of pilgrims journeying to see the Holy Father in 2007 does not surprise me. Vatican City, Jan 8, 2008 / 10:22 am (CNA).- Recently released figures reveal that pilgrims continue to come to Rome in significant numbers under Pope Benedict XVI’s pontificate. 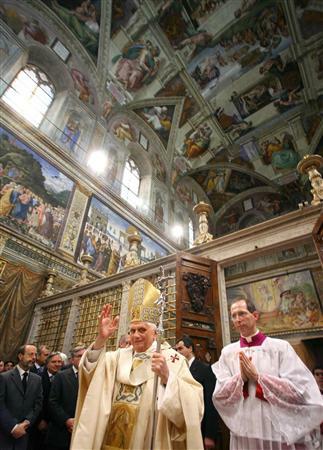 Nearly 3 million people came to Rome in 2007 to hear the Pope speak at his weekly audiences and Sunday addresses. The number, slightly lower than 2006, compares favorably with the numbers of Vatican visitors who heard Pope John Paul II in person. Some observers believe that the increase of visitors as compared to John Paul II is connected to the decrease in Pope Benedict’s world travels. Since people reason that they are less likely to see the Pope while he travels, they visit him at the Vatican. Pope Benedict’s writings have also attracted attention. His book Jesus of Nazareth has sold two million copies, while his second encyclical Spe Salvi has sold 1.5 million copies in Italy alone. ''It seemed impossible to imagine a successor to John Paul II who could approach the media success that the 'great' Karol Wojtyla had, but the shy and discreet Ratzinger has done it,'' commented the Italian paper Corriere della Sera. The Pope is expected to write two more encyclicals and the second volume of Jesus of Nazareth in 2008. He has scheduled two more trips within Italy and three trips abroad, including a visit to New York City and to World Youth Day events in Sydney. 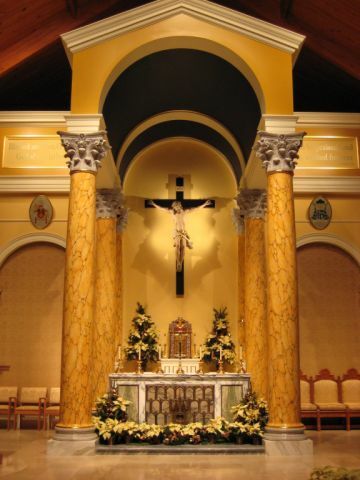 As of February 2008 St. John the Baptist Church in Costa Mesa California will have a Sunday Tridentine Latin Mass (High Mass) at 12:30 PM. This means that in Orange County, California there will be four parishes holding the traditional Mass! It is always such a pleasure to see the transformation of a parish church from the barren product of past decades to a house of prayer properly adorned for the worship of the one, true God. With the permission of the pastor, here are a few images of St. Theresa Church, which has undergone a profound transformation. 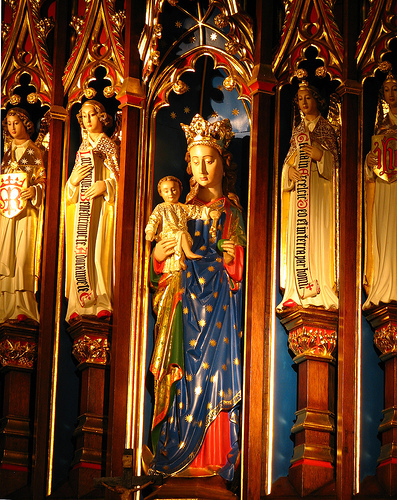 Notice the details in the after image including a crucifix and additional candles on the altar. I posted this tonight on Fish Eaters Forum. Would anyone visiting my blog be interested in joining the project and try to help evangelize through the Internet? Please help spread the word about this idea. If someone is interested, please tell them to email me. As some people know, I am home from seminary for Christmas break and I have spent a lot of time online. I usually try to evangelize and spread the Gospel on forums and sites like Yahoo Answers and Askville. However, it is becoming more and more clear to me that the Internet is in disarray. Is this the time of the Great Apostacy? Ever site that I use I will either encounter pagans, Wiccans, Muslims, or atheists attacking Christianity. If not them, then I encounter Protestants, usually evangelicals and fundamentalists, who are so anti-Catholic that it is sickening. Much of the reason that there is a poor opinion by atheists of Christianity is based upon their encounters with Protestants. It all very sad and distressing. I occasionally post on Phatmass and they have a Crusade. It is an organized project where several members work together (it is in a locked forum) and coordinate efforts to evangelize the Internet. They may have a four specific forms to evangelize and have 6 people working on each one. Do you think that sometime, even in the future, Fish Eaters could do this? I love this forum - it is a relief in the midst of a desert. This is my oasis. I am thankful for this forum and I think that we could not only evangelize non-believers but help spread the truth about modernism to fellow Catholics. Any opinions on this idea? PS: Please realize that this is not a full-time responsibility. I also have a lot of obligations (seminary, college classes, family life, etc). For those that are interested, I am just asking for a commitment to help whenever possible. If you are interested in doing this, please let me know and comment below. We need as many people as possible before we split up into squads. Update (Dec. 2008): The founder of LifeTeen has been excommunicated. The following news story is from AP/AZ Central. As a Traditional Catholic, I have never supported the Life Teen Movement since, in my experience, liturgies involving LifeTeen commonly foster a lack of piety and Catholicity through liberal, modernistic tendencies. Above all, though, this news about founder of LifeTeen leaving the priesthood and the Catholic Church in order to offer "services" at a nondenominational Praise and Worship Center is highly disheartening. I encourage all people to pray for him. The former pastor at a Mesa Catholic church who faces seven misdemeanor charges of sexual misconduct has started a new worship center and conducted his first services. More than 500 worshippers gathered to hear Dale Fushek conduct a service at a Mesa hotel Thursday. Known as "Monsignor Dale" during his 20 years at St. Timothy's, Fushek co-founded the national Life Teen program and served as vicar general of the Catholic Diocese of Phoenix. But all that came tumbling down in late 2005, when he was arrested on one count of assault, five counts of contributing to the delinquency of a minor and one count of indecent exposure. He is accused of engaging in sexually related discussions with teenagers during confessions and exposing himself to teens as he got into his hot tub. Fushek was suspended by the diocese and is now resigning from the priesthood. He is tying to win the right to a jury trial on the charges and a hearing is pending on that issue before the Arizona Supreme Court. On Thanksgiving Day, he said he was happy to be back before a group of worshippers. "I feel alive again," he said after the two-hour morning service. "This was inspiring and beautiful. I thought there was a really good spirit among the people here." Fushek said he started the nondenominational Praise and Worship Center as a place where people can come to worship between regular services, not as competition for the Catholic Church. "This is not a church. It is not intended to draw people away from their denominations," he said. People in attendance at the first service waited in long lines to personally thank Fushek for starting the center. Phoenix, Jan. 4, 2008 (CWNews.com) - Church leaders in Phoenix, Arizona, are discouraging Catholics from attending non-denominational services conducted by a suspended priest, the Arizona Republic reports. Msgr. Dale Fushek, who has been suspended from public ministry by the Phoenix diocese, continues to lead services at the Mesa Convention Center, drawing several hundred participants, the newspaper reports. The flamboyant priest, who gained national prominence as the founder of the LifeTeen program, risks further disciplinary action by defying the terms of his suspension to preach at "Praise and Worship" services. Fushek, who was once the vicar general of the Phoenix diocese, was suspended after he was accused of molesting a boy in his Arizona parish. Although the diocese settled the lawsuit based on that charge, Fushek still faces several other criminal charges involving sexual relations with teenage boys. 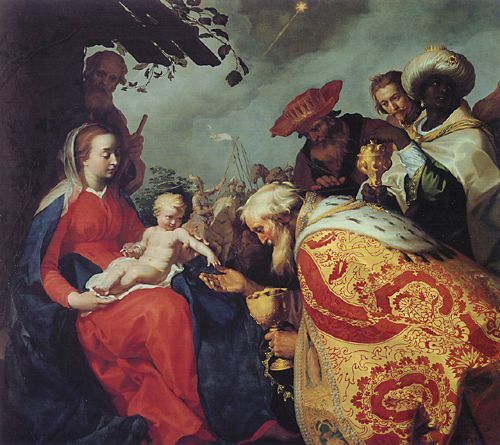 For the traditional readings and prayers at Mass on the Epiphany, please click here. According to the Tradition of the Catholic Church, the three Kings (Wise men) mentioned in Matthew 2:1-9 represent the three ages and three "radical types" of man, each wise man further representing one of Noah's descendants (Sem, Cham, and Japheth). According to the Tradition of the Catholic Church, there truly were three Wise Men: St. Caspar, St. Melchior, and St. Balthasar. St. Casper is traditionally described as young, beardless and the descendant of Ham who brought frankincense to the Child Christ. St. Melchior was old and had a white-colored beard; he was the descendant of Sam who brought gold to Jesus. And finally, St. Balthasar was a bearded, black descendant of Japheth, in the prime of his life, who brought myrrh. These are all related from the words of the Venerable Bede. As Fish Eaters website states, "Tradition also has it that the kings were baptized by St. Thomas, and they are considered Saints of the Church. Though their feasts aren't celebrated liturgically, the dates given for them in the martyrology are as follows: St. Caspar on 1 January; St. Melchior on 6 January; and St. Balthasar on 11 January." 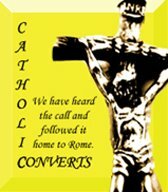 Rome, Jan. 2, 2008 (CWNews.com) - In a year-end account of missionary deaths, the Fides news service has named 21 Church workers who died for the faith in 2007. The Fides report lists the priests, religious, and seminarians who were killed during the year. The report notes that the number is slightly down from the 24 who died in 2006, and the 25 in 2005. Because the circumstances of their deaths were different-- and in several cases unclear-- Fides does not refer to the 21 people who died as "martyrs." But the report notes that each of them "without a doubt made a radical decision: to be witnesses of God's Love often in situations of violence, degradation, material and spiritual poverty, total disrespect for the dignity and rights of the human person." Asia saw the deaths of 8 missionaries in 2007: 4 priests, 3 deacons, and a seminarian. In Latin America there were 7 deaths: 6 priests and one religious brother. More surprisingly, 2 priests were killed in their homes in Spain. Acknowledging that there are many others who die for the faith and remain unrecognized, Fides has asked readers to supply any information that could supplement the annual count. Father Mario Bianco, an Italian Consolata missionary, who died in Colombia on February 15. Father Martin Addai, a Ghanaian White Father, who died in Kenya on March 10. Father José Luis Camacho Cepeda, a Peruvian, who died in Colombia on March 11. Father Fransiskus Madhu, an Indonesian Divine Word missionary, who died in the Philippines on April 1. Sister Anne Thole, a Franciscan from Swaziland, who died in South Africa on April 1. Father Richard Bimeriki, a Congolese priest, who died in Rwanda on March 12. Father Wolfgang Hermann, a German Fidei Donum missionary, who died in Brazil on April 10. Father Salvador Herandez Seller, a Spanish priest, who died in Spain on April 11. Father Humberto Macias Rosales, a Mexican priest, who died there on May 1. Father Raghiid Ganni, a Chaldean Catholic priest, who died in Iraq on June 3 along with 3 deacons (below). Rev. Basman Yousef Daoud, a Chaldean deacon, who also died in Mosul on June 3. Rev. Ghasan Bidawid, a Chaldean deacon, who also died in Mosul on June 3. Rev. Wahid Hanna, a Chaldean deacon, who also died in Mosul on June 3. Justin Daniel Bataclan, a Filipino seminarian, who died on June 7 in Quezon City. Brother Enrique Alberto Olano Merino, a Little Brother of Mary from El Salvador, who died in Guatemala on June 9. Father Tomas Perez, a Spanish priest, who died in Spain on July 16. Father Fernando Sanchez Duran, a Mexican priest, who died there on July 22. Father Ricardo Junious, an American Oblate of Mary Immaculate missionary, who died in Mexico on July 29. Father Florante Rigonan, a Filipino priest, who died there on August 27. Father Nicholaspillai Packiyaranjith, a Sri Lankan priest, who died there on Septemerb 26. Father Allard Msheyene, a South African Oblate of Mary Immaculate missionary, who died in South Africa on October 6. Did anyone reading this post know of any of these missionaries and/or have photographs of them? O Almighty God, Lord of the harvest of souls, we ask You to guide and bless all who have gone forth to preach the gospel. Endow them with the gifts of generosity and concern. Send your Holy Spirit on them, that He may strengthen them in weakness, comfort them in trials and direct their efforts. May He open the hearts of their hearers to receive Your message. Let Your revelation enlighten all minds for the salvation of souls, and let Your love heal every heart and body for the happiness of each person. May all people consciously acknowledge You and serve You by living the teachings of Your Son. We ask this through Christ our Lord. Amen. On Aug. 1, 1944, Heliodore Mejak said his first Mass at Holy Family Church in Kansas City, Kan. Sixty-three years later, the church is looking for a new priest. Mejak, 98, died Christmas Day, ending perhaps the longest tenure of a priest at a U.S. parish. Monsignor Mejak may also have been the country’s oldest active priest, according to the Archdiocese of Kansas City in Kansas. “To be that old and to continue to function and to care for the community, that certainly shows his dedication and his love for his people,” said Thomas Tank, vicar general of the archdiocese. Mejak became a priest in 1935 and served under seven popes. When Vatican II called on people to shake hands or hug as a sign of peace during Mass, Mejak ignored it. Kirk Kramer, an editor of the Digital Library of the Catholic Reformation in Virginia, attended Holy Family Church in the 1980s while a student at the University of Kansas. He recalled Mejak’s church as a refuge for Catholic traditionalists. Mejak was a train buff who built electric trains in the church basement that he liked to show children, Grelinger recalled. He built the trains using old pictures and drawings as a guide. Mejak graduated from what now is Bishop Ward High School in 1927. He went to St. Benedictine College in Atchison, Kan., and Catholic University in Washington and became a priest in 1935. In both 2006 and 2007 I have helped facilitate a Saint for the Year Devotion, by which participants have a saint chosen for them for the year. It is a devotional activity and each person is asked to pray to the saint in a special way throughout the year. For more information on this devotion, which even St. Faustina participated in, please visit my 2007 Saint for the Year Post. This year I was chosen by St. Julius, feast day on April 12! This year, however, since I am in seminary, I do not have the time to continue the Saint for the Year Devotion. I hope to resume this devotion in later years.